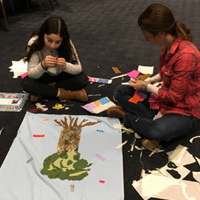 Work with artist and Jewish educator, Heather Stoltz of Sewing Stories, to create a personal Torah cover that will cover the Torah at your Bar/t Mitzvah! You will join together as a family and talk about what is most meaningful to you, and then turn those ideas into a personal Torah cover! Bagels and coffee, of course, will be served. This is a truly meaningful project that adds a unique, personal touch to this special milestone. The cost is $18/student. At least one parent is required to attend with his/her child. Register for this program below no later than FRIDAY, MARCH 8. 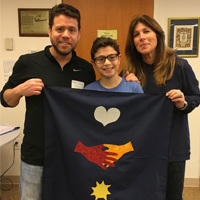 Heather will also be offering a two-session tallit-making course (March 10 following this program and March 24) that we encourage you to attend as well. 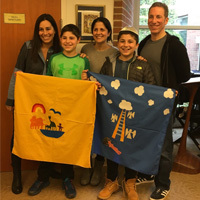 Imagine how special it will be for your child to wear a handmade tallit. Parents can make their own, as well. 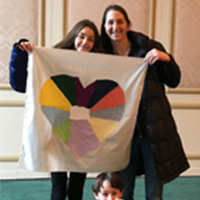 Click here for details on the tallit-making workshop.